“It’s been three of years since we stopped using excel,” Varsha Ghodke, Senior Counselor at top higher education institute in Pune says with pride. She has worked at the institute for long time, so she has seen the full evolution of administration operations. Since the past few years, the number of students that were admitted in the institute has doubled in itself and is on an upward rise. The institute also setup couple of campuses in new cities. When asked what aided this transformation, She replied “a world class CRM did”. Technology has replaced everything! Grocery is bought on phones today & houses are rented on few website clicks. The education landscape is far from being an exception. Our customers – “students”, “parents” and “alumni” have also been consumed by this progression forcing a new era of Higher Education Institutions to emerge that have not only understood this shift but also embraced it. 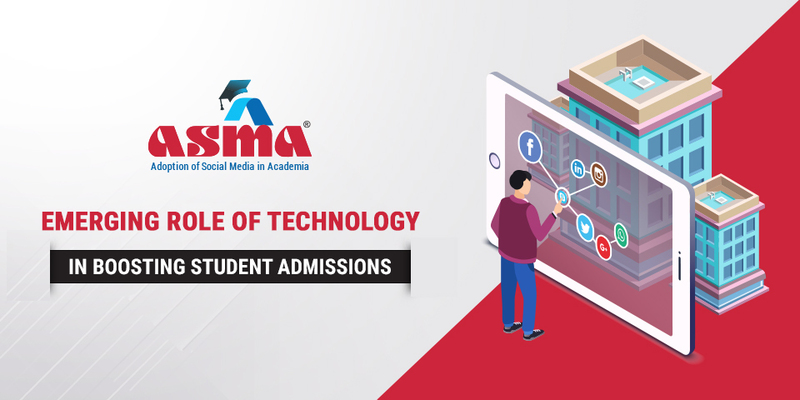 As the UGC has set foot into the waters to scoop out the fittest to survive the race, let’s look at some technological innovations that have become an epitome to Student admissions. Many counselors like Ms. Varsha have fought hard to win battles everyday by selfless indulgence into technology. Digital Application Forms and Cloud telephony have replaced excel sheets and land phones. Advanced CRM systems with Artificial Intelligence are already a reality. Innovative tools like Chatbots and Automated Marketing Software are a few tools that can effectively digitize the admissions process. A CRM – Customer Relationship Management system lies at the heart of the process. It brings all the marketing, enrolment and engagement tools onto one platform. From auto capturing leads to qualify the leads i.e. identifying the genuine prospects by their activities and online behaviour, a CRM helps the counselor to persuade the prospects by communicating and following-up the prospect by sending him information about the institute, send general reminders and thereby help them in the final conversion i.e. get admitted in the institute. According to the survey of around 603 admission enrolment & marketing professionals in U.S.A. by Advance Global Higher Education (AACRO) publication on State of CRM in Education Report the findings were pretty clear. The benefits of using a CRM System are numerous. From driving a faster service to increasing satisfaction by building trust amongst the customers, a CRM is capable to do what it takes to ensure more results. Automating activities like timely follow ups, instant communication response and tracking everything in your sales and marketing cycle end-to-end will need an independent CRM that is your best friend in growth. Live chat has been a powerful tool for student engagement over the last few years. Chat is as crucial to a website as is a website to an organisation today. This has been all the more important with advent of chats like WhatsApp which have made “chatting” the default conversation channel amongst the new generation. But the core problem that lies in executing this is the need for a dedicated resource in order to have a successful live chat. Adding to the limitation of timing and multiple engagements. On average 92% of the students browse the internet only after 8 in the evening. Chatbot provides a solution to this. So what is a chatbot. No need to overcomplicate it. A bot is nothing more than a computer program that automates certain tasks, typically by chatting with a user through a conversational interface. The most advanced bots are powered by artificial intelligence, helping it to understand complex requests, personalize responses, and improve interactions over time. It’s as simple as ordering a list of if-then statements and answering all course related queries, often without any technical mumbo jumbo. Aside from being awesome for helping with student admission queries, AI-powered chatbots can be part of your marketing initiatives and help push your students seamlessly through your admission funnel. What can a chatbot do for a college/university? Larger student engagement – Chatbots are unique because they not only engage with your students, they also retain them. No Limit Outreach – Because chatbots are sitting 24*7*365 perennially on your website, landing pages & admission forms, you could engage any number of students at the same time and at any time. Application forms are not new to the battlefield. In this economy, quality beats quantity. Easing the admissions process for students and making it fun is a core achievement of having engaging online application forms. Automating qualification criteria as well communication at different steps to filter out only the required students takes away a huge pain for the admissions team as well as students. Just as a supermarket serves the ease of buying everything in one place, having communication – Follow Up – Interview – Admissions in one place makes for an end-to-end system for a Higher Education Institute. This enables better quality and quantity in admissions over the years. Automated SMS and Email is a must if you wish to beat your competition to reach your prospect student. Automated Call recording and auto log is important when there is a large inflow of calls especially education being a seasonal affair. There are many cloud telephony and IVR service providers that help achieve this easily. Knowing the problem, is solving half the problem. Measuring performance of all resources in admissions – the counselors, publishers, marketing channels, demographics of prospects, etc. is the key to utilising the resources in most efficient manner. More importantly, the analytics must be available real time and on the go so the course correction in the strategy can be taken before all is lost. Predictive Analytics – Will a prospect candidate take admission to my institute? The holy grail question in any buying process is an ability of the seller to predict the “buying decision” with some accuracy based on prior buying patterns. The e-commerce companies leverage this with recommendations & offers facilitating more up-sell & cross-sell. Case in point Amazon’s recommendation engine. In Education the winning technology in “Education Marketing” will be able to answer the question with a percentage probability of a prospect taking admissions in an institute. To summarise, it’s the makings of a marketer’s dream: a world where institute brands can build authentic relationships with their students, and students can learn to engage with institute seamlessly. Embracing these marketing changes today is a true competitive advantage for institutes.